The ruling class of this country not only controls our political and economic systems, but also the mainstream media and in effect, the news that we consume. Did you know that The Walt Disney Company owns ABC? How about Time Warner? Did you know it owns CNN? Did you know that News Corp owns Fox, the Wall Street Journal and the New York Post? 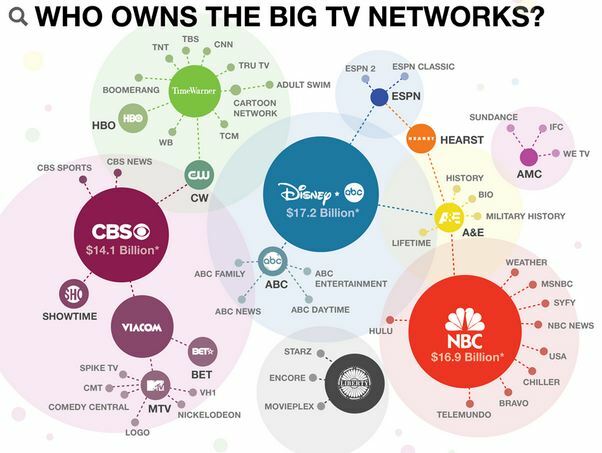 Did you know Comcast and GE own MSNBC, NBC News and CNBC? What about this news source, here? Did you know Verizon, which now owns AOL, owns The Huffington Post? Did you know most people don't know any of this? As Bernie Sanders said in an interview on The Young Turks, "The media is an arm of the ruling class of this country." We couldn't have said it any better ourselves. 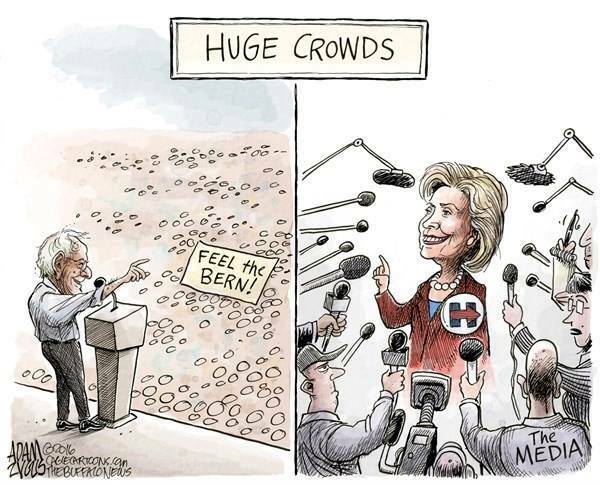 Sanders continued, "I think what you have is a corporate media, which by definition has conflicts of interest." He went on to explain that companies like Disney pay their workers in Disney World $8 or $9 an hour. The terrifying reality is that these same companies own ABC and other major news outlets. No wonder you don't see ABC or MSNBC running specials on the minimum wage or wealth and income inequality. If the mainstream media began covering our nation's asymmetrical distribution of wealth, if our electorate became more informed about the disintegration of the middleclass, maybe, just maybe, people would rise up and demand real change. That's a notion that absolutely horrifies the executives of Comcast and Disney. Ask yourself, why isn't there more climate change coverage? Why doesn't CNN spend more time talking about overturning Citizens United? Could it have anything to do with the fact that the corporate media collect huge sums of advertising money from the fossil fuel industry and the super PACs that only exist because of Citizens United? Do the media executives behind the scenes (and TV screens) want to destroy our planet? Do they support billionaires buying elections? Do they like watching laborers in Disney World work longer hours for lower wages while their companies' profits skyrocket? Chances are, these executives are mothers and fathers. Chances are, they do care about the American people. They just care much, much more about their profits. 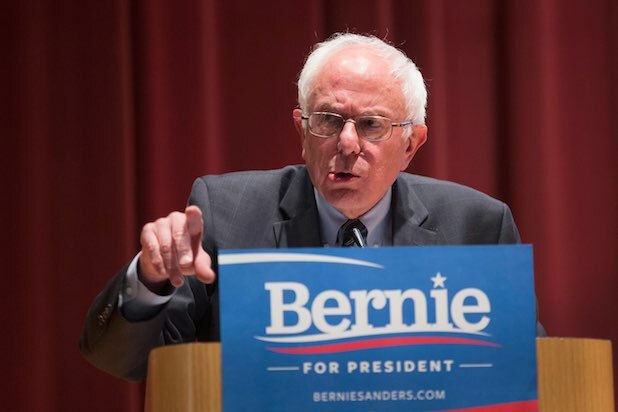 Today, The Wall Street Journal ran a piece entitled, Bernie Sanders Gets No Respect, which is ironic in itself because the WSJ has generally written off Senator Sanders, just as The New York Times, CNN and MSNBC have written off Senator Sanders. When the New York Times recently published a positive article about Sanders, it later went to great lengths to edit that piece and make it much less pro-Sanders. Sanders supporters have grown sick of the media's Clinton bias and most recently, their tendency to include super delegates in their delegate math, which gives Clinton a massive and misleading advantage because super delegates can still switch sides. 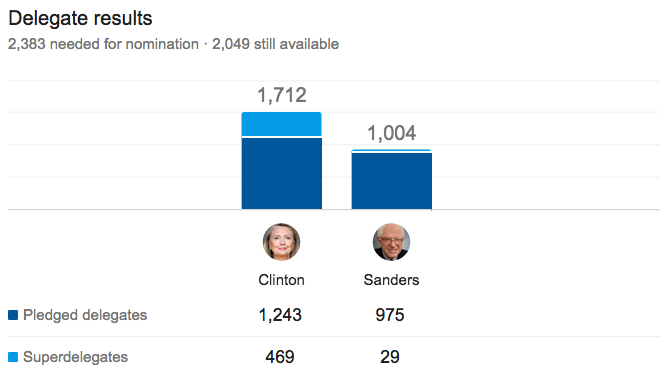 CNN, MSNBC and even Google almost always factor the totally-unofficial-super-delegates into their delegate counts, making Clinton look lightyears ahead of Sanders. If you notice, in the image above, it's the light blue (super delegates) and not the dark blue (pledged delegates) that position Clinton as the clear Democratic frontrunner. 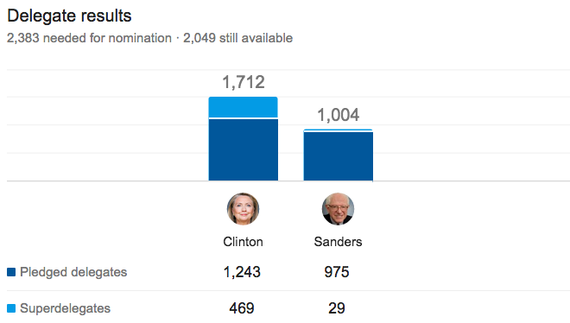 The problem is, in their highly scientific "delegate math," CNN, MSNBC and Google are including the super delegates who haven't even voted yet. This is a dirty and clever little trick designed to conceal the viability of a Sanders' nomination. Including super delegates at this point is not only misleading, but downright dishonest because the super delegates won't vote until the Democratic National Convention. As they did for Obama in 2008, super delegates can and will transfer their support to Sanders if the Senator continues to win in primaries and caucuses. Last week, the WSJ reported that Trump needs to win 57% of the remaining delegates to clinch the GOP nomination, stating that he has "a feasible path to winning." 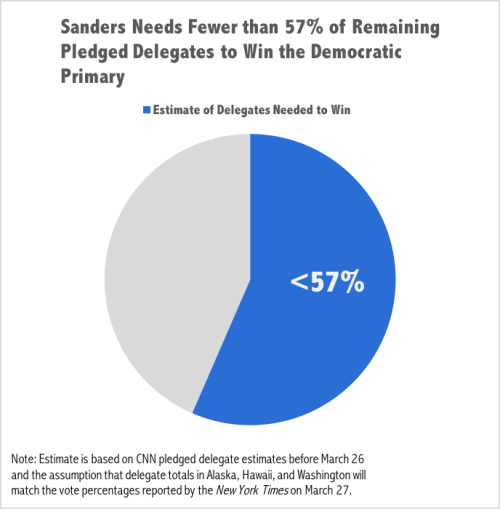 After sweeping three Western caucuses and winning 6 of the last 7 delegate battles, now it's Sanders who needs only 57% of the remaining delegates to surpass Clinton and make the case that super delegates should switch over to his camp. But of course you'll never hear the WSJ describing Sanders' opportunity as "a feasible path to winning," despite the fact that both he and Trump need the same 57%. It's not just the media bias that drives Sanders supporters bonkers, it's the lack of coverage their candidate receives, especially in the earlier months of his campaign. In 2015, for example, ABC World News Tonight allocated a mere 20 seconds to covering the Sanders campaign, while spending over 80 minutes talking about Donald Trump. Similarly, CBS set aside just six minutes to covering Sanders and NBC Nightly News spent less than three. When social media was buzzing about Sanders' historic upset in Michigan, the mainstream media was quiet. At that time, I published the article: Sanders Massively Outperforms Expectations in Michigan Primary, CNN Ignores It to Cover Trump. Why would the mainstream media want to silence a popular presidential candidate who's educating the American people about our corrupt campaign finance system and vast levels of wealth and income inequality? Why would the corporate media have a bias towards Hillary Clinton? Why would Time Warner and Comcast, the parent companies behind CNN and MSNBC, be among Clinton's top 10 campaign donors? Could it have anything to do with money?